Here I was thinking that being on holidays meant sleeping in .. a bit! … wrong! 6am alarm, 6.30 breakfast and a 7.30 pick up with Mr Phuc (pronounced Mr oo you rude people) and we were off to the DMZ. Now I know there were no Aussies up in this part of Vietnam during the war but…. Dong Ha is the capital of the Quang Tri provence and was the HQ for the US Marines from ’68-69 and is the closest town to the 17th parallel and the DMZ between North & South Vietnam. Our guide Mr Vu is based here and we arrived to pick him up about 9am. Heading west along Route 9 (built by the French) towards the Lao border, through a wide valley ringed with tall peaks (well maybe not that tall – the heights actually range up to about 1000m) wre are actually travelling vaguely parallel to the actual DMZ. First stop was at Firebase Elliot, looking out over the Rockpile and further on to the radio relay peaks controlled by the US Marines and the NVA area further north. The Rockpile is a huge solo lump of rock – very appropriately named, steep and un-climbable. The 10 Marines stationed there were dropped in, re-supplied and replaced by helicopter drop. Some seriously good flying since the flat bit at the top is only about 10m x 3m – and not exactly flat. Firebase Elliot straddles Route 9 and has great views to the north… the Marines & their big guns were based here. It’s littered with bomb craters and the evidence of US forces is everywhere – we found the remains of beer cans, ponchos, sandbags, boots etc – all just laying round and this is after the locals have been through looking for scrap metal. Next stop was Khe Sanh – legendary title of the Cold Chisel song and scene of a siege which was in fact intended as a diversion from the main Tet Offensive of early 1968. The NVA besieged the Khe Sanh airbase for 5 ½ months from January and during the fighting the Yanks dropped 100,000 tons of bombs on the area . When the siege was finally ‘broken’ (the Marines ‘rescued’ by the army) and the Yanks pulled out, everything was destroyed so what we saw is replica/reconstruction. 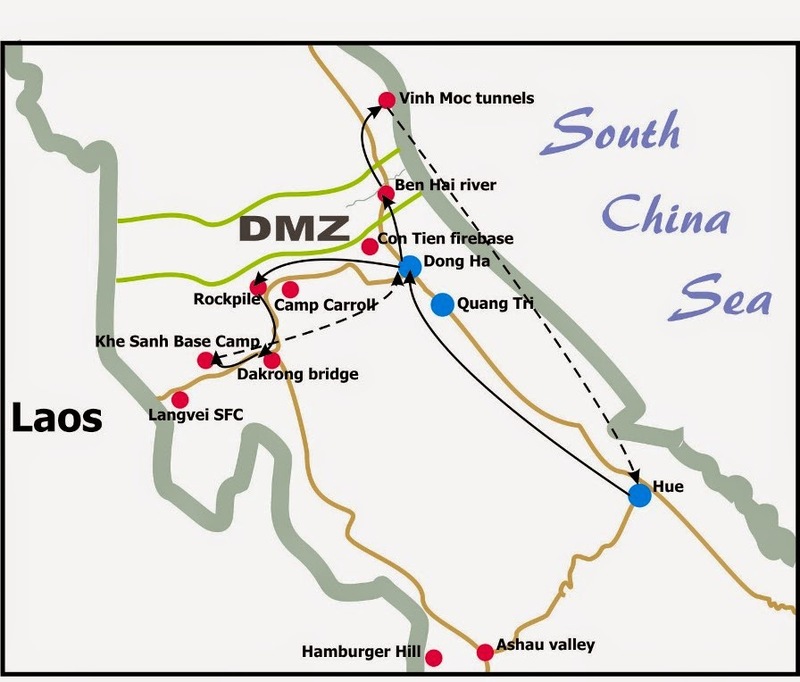 The afternoon sites were to be the actual 17th parallel and the bridge over the Ben Hai River. This was where the North and South faced off armed with loud speakers among other things. The original bridge is long gone and the replacement is apparently not on the ‘exact spot’ Strangely it is painted blue for one half and yellow for the other half – each side painting, repainting, painting again trying to get the psychological upper hand. There is a small museum nearby with a couple of loud speakers out the front – the ones on the north are massive. Last stop was at the Vin Moc tunnels. Vin Moc was a small fishing village of about 350 people before the war. When the Americans started naval bombardments, the locals refused to leave and instead, dug themselves a series of tunnels to live in. Three levels deep, ranging from 12 to 23 metres deep and with openings into the cliff side facing the sea (for ventilation and escape) they are nothing short of astonishing. A communal kitchen, living spaces, individual family rooms and a maternity room were carved out of the stiff clay earth and the spoils used to fill in bomb craters… talk about ingenious. The drive back to Dong Ha was via the coastal road – along past some of the most beautiful beaches you will see anywhere. Just wait till the Hiltons or the Sheratons figure this out … though part of me hopes they never do and the locals can continue to enjoy them without the corruption that invariably comes with this kind of development. We dropped Mr Vu back at his office and finally arrived back in Hue about 7pm. A long day, but fascinating. Tomorrow is thankfully a later start – we’re heading out to see the tombs of the Nguyen Emperors.